You may have noticed a change to the GOES-R RGBs in AWIPS since the May/June 2018 RPM update. A new and improved method for calculating the RGBs was implemented. One of the most notable benefits of this change is that users can now control the ranges of the three RGB components based on the physical units (reflectance, brightness temperature), instead of the 0-255 color range as was the case before (Fig 1). 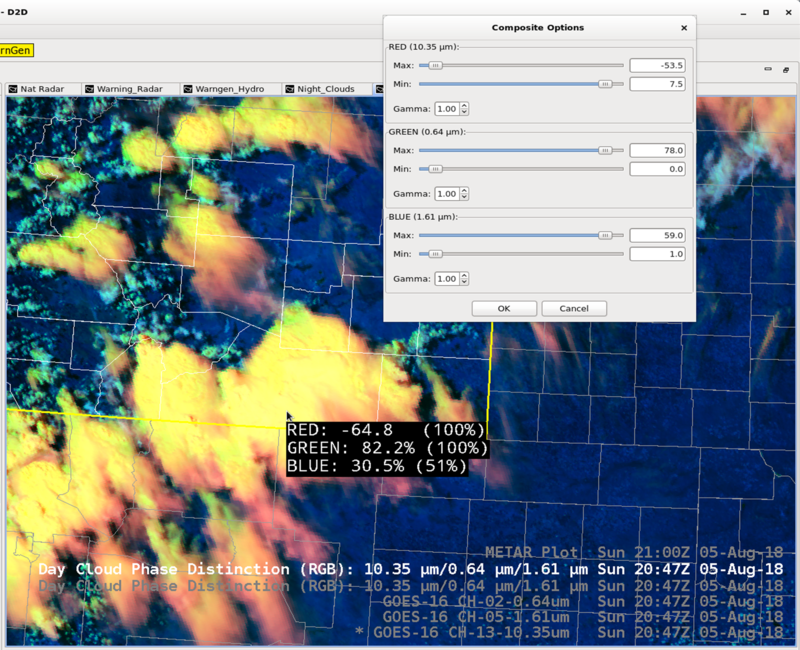 Similarly, when sampling the RGB in AWIPS, users now see the physical units for each of the three RGB components (Fig 1). The new method for computing RGBs may also lead to improved performance on AWIPS workstations. Finally, minor projection issues are resolved with the new method. Users are reminded that the default RGB ranges were chosen for a reason, and altering them will change the interpretation of the RGB, potentially negatively. Below is an example of how a user may alter an RGB (Fig 2 and 3). The “simple” Day Cloud Phase Distinction RGB is great for differentiating various cloud types and clouds from snow from bare land, during the day. In this RGB, however, the green component (0.64 um) becomes saturated fairly quickly (reflectance >78%). So, for example, forecasters cannot interrogate features atop deep moist convection using this RGB that are otherwise apparent in visible imagery (texture, overshooting tops, etc) . This isn’t necessarily one of the purposes of this RGB, but a forecaster may want to expand it’s capabilities regardless. With the new design, a user can simply load the composite options for the RGB, and adjust the max for the green component up to, say, around 100%. This change allows for details in the visible channel to be apparent in this RGB. However, users must keep in mind the green influence will be less for all features in the RGB. Low water clouds will appear closer to blue than blue/green, and snow will be a darker shade of green. 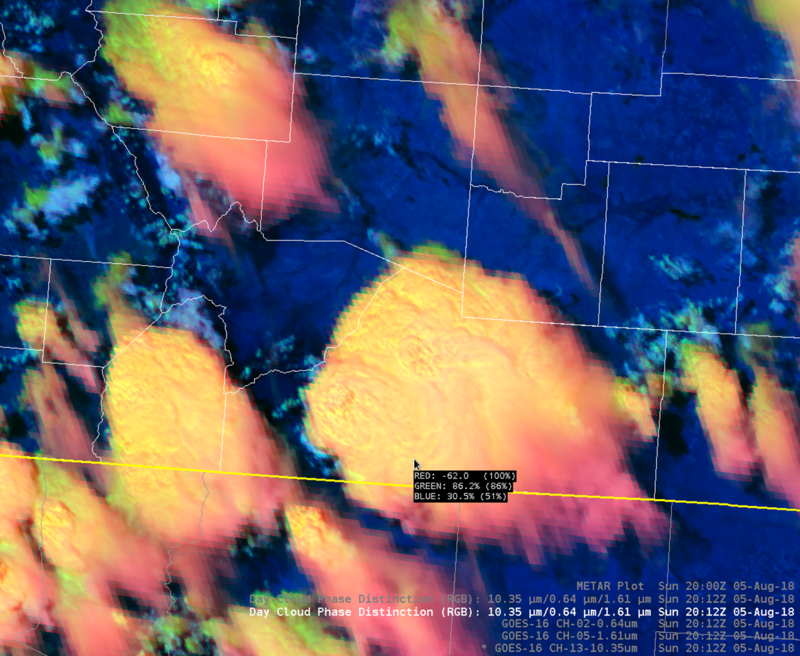 Highly reflective cold cloud tops (deep convection) may appear more red than yellow.